The top 10 brunch restaurants in North Toronto don't quite compare with the options downtowners have, but when you are stumbling out of bed on a Sunday morning, proximity to the hair of the dog is key. While some of these locations might look familiar to those living south of Bloor, their sister restaurants sometimes retool things slightly based on the local eating habits. 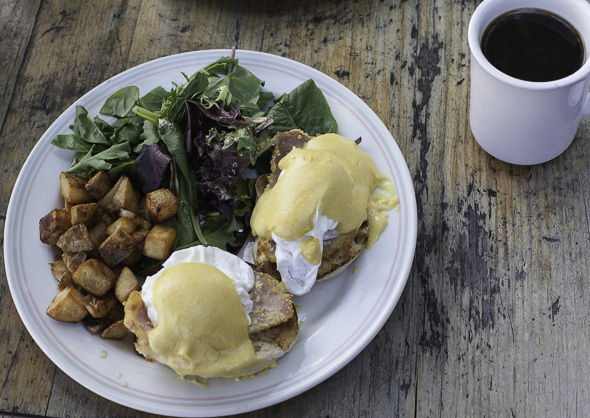 Here are my picks for the top 10 brunch restaurants in North Toronto. Just south of York Mills is one of North York's best patios, the Miller Tavern has a cedar lined multi-level patio, with a cottage like atmosphere using lush greenery to provide a screen between you and busy Yonge St. With a three course ($27) prix fixe menu that includes a cocktail; this no brainer brunch has the predictable plates like Benedicts and French toasts but gets amped up with truffle poached Eggs or the lavish lobster and shrimp frittata.ggs C Scallops ($12.99), stick to one of these classic dishes and don't look back. Fresh squeezed orange juice is the real deal, or turn it into a Morning Glory and seize the day.